With the Russell Hobbs Your Creations Stand Mixer the world of food is at your fingertips. Using just one appliance you can prepare the ingredients for a banquet; blend sauces, bake cakes and more. So if you enjoy cooking and experimenting with recipes, this could be the gadget you’ve been looking for. With 1000W of power and planetary mixing action, this Stand Mixer will become your baking side-kick, making easy work of mixing up large batches in one go. It comes complete with a 5 litre stainless steel mixing bowl, and has a transparent splash guard with window for adding extra ingredients as you go. The additional jug blender attachment also means that you’ll need one less appliances cluttering up your worktop and can be easily attached and removed as you wish - allowing you to easily whip up anything from smoothies to soups. The guard keeps your walls and surfaces free from splashes. Lets you check the progress of your food and add extra ingredients as you go. 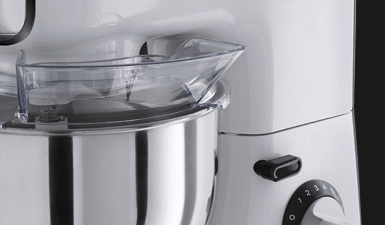 Product includes three mixing attachments: beater, dough hook, whisk as well as a jug blender – an all in one appliance to cater for a range of recipes. 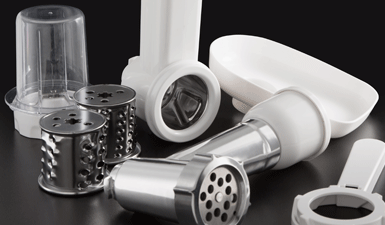 Grinding Cup, Slicer & Shredder and Meat Grinder are available to purchase separately.